Formulate and secure framework in order to create a safe and healthy for all employees under IBN OMAIRAH also to minimize the impact and the consequences of company activities on the environment. Identify expectations relating to legal requirements for occupational health and safety also keeping the environment cleanliness and free from any hazard. IBN OMAIRAH is committed and confirm that the company’s main objective is to preserve the safety and health of its employees and to fulfill its obligations with regard to the protection of others who are affected by its activities and we are committed to protecting the environment and preserving the environment. The Natural of our work and activities are committed to the conservation of energy, water, natural resources, recycle materials and reduce waste wherever possible and we will be the best Citizens through the assure that our facilities and our work does not pose any risk to the environment and to participate in social activities that lead to an upgrade good practice for occupational safety and health and hygiene environment. We will work in all of our activities on the development and application of appropriate systems and procedures that are designed to comply with applicable laws and regulations also the requirements of the license and the expectations of partners. IBN OMAIRAH Company is responsible for develop plans and designs for projects and facilities to minimizing the effects and risks during the period of their work and will be compatible with the goals and directions of our customers. A- Prevent injuries or work-related diseases. B- Prevent damage to property or equipment as a result of our work. C- Prevent negative effects on the environment of the implementation of projects or business. 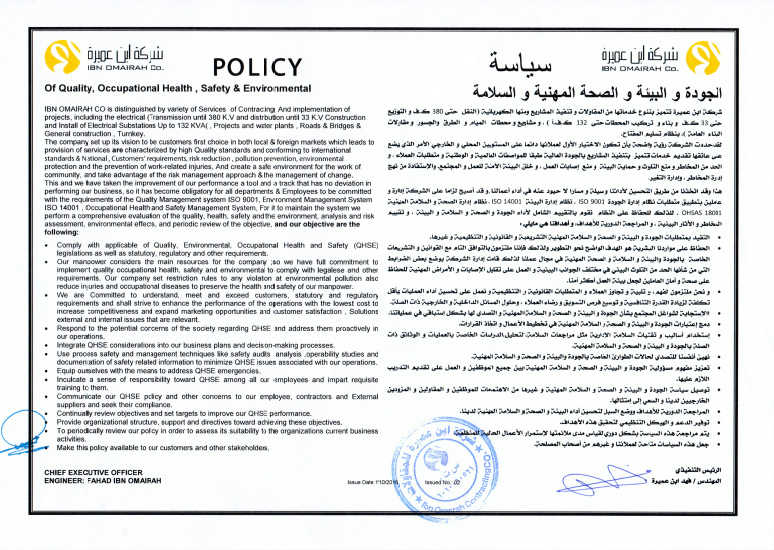 A- Promote guidelines to plan the environment, safety and occupational health. B- Comply with all environmental and occupational health and safety standards systems.